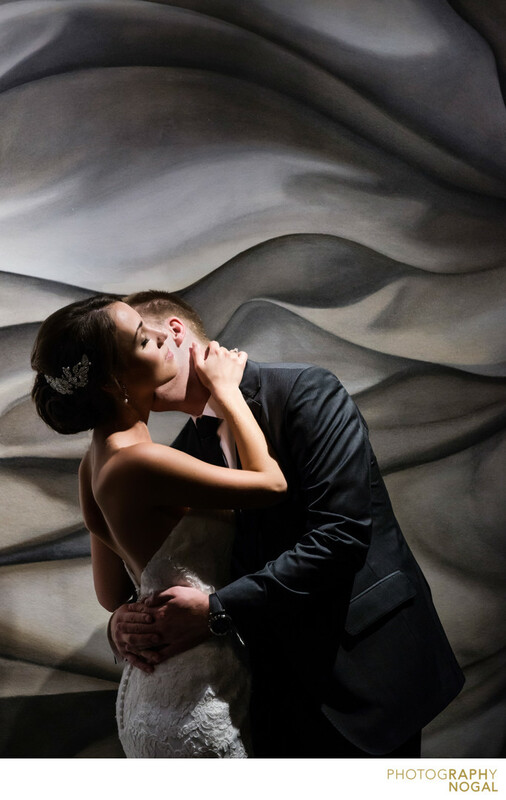 This photo captures a warm moment between the bride and groom among the art pieces at the Arcadian Loft in Toronto. The actual artwork was used as a backdrop and adds fluid movement to the photo. Strategic lighting was used to add another element of creativity, by playing off both the couple and the artwork. This photo was taken with a Nikon D750 DSLR at ISO 1600, f3.5 aperture, 1/400th shutter speed with a Nikon Nikkor 24-70mm f2.8 zoom lens, at 66mm focal length. Lighting was ambient light provided by the spotlight on the cieling. Location: 401 Bay Street, Toronto, ON M5H 2Y4.